A classic British Christmas lunch is very much a hearty roast and all the trimmings. But Christmas is more than just that one meal. With lunch served traditionally before the Queen's speech at 3 pm, there is a long day ahead. So, typically there will be a supper in the evening, and let's not forget Boxing Day on the 26th, when a buffet table for friends and family is the order of the day. With so many buffets and light meals, this is where the lovely British tradition of chutneys, pickles and jams come into play. To enhance all the Christmas pies, pasties, cheeses and savories, there will always be an array of preserves. Some of which have been served for centuries, while others are more modern interlopers, but have now become very much part of these fantastic meals. Here are ten of our favorites, all or some of which will put in an appearance over Christmas, as well as New Year - or Hogmanay, as it is known in Scotland. Best part is that all of these can be made in advance, as they all store very well. One more recipe for Christmas cooking that's out of the way. No self-respecting cheeseboard or Boxing Day buffet would ever be seen without a bowl or jar of traditional pickled onions. The pickles can be made well in advance, from a few weeks to several months, and will mature beautifully in the jar. The high volume of vinegar and spices means that even after opening, they will keep for up to one year. This pretty relish made with cranberry and port is something of a newcomer to the British table and has come about with the increased enjoyment of all-things cranberry. Cranberry sauce is now very popular at Christmas in Britain, and this sauce flavored with port makes a great substitute. Doesn't hurt that it brings a more British taste to the food. Not a pickle, chutney or relish, this recipe is a jelly. However not the U.S. understanding of the word, but rather the British, clear set preserve. Rowan berries make a sparkling, clear jelly which is perfect for all game dishes, especially game pie. Great at all your Christmas meals, suppers and buffets, this is a recipe we highly recommend testing out this year. Another relative newcomer to a British Christmas is a thick, sweet-sour chutney made from roasting the flesh of a pumpkin. Before cooking as a chutney, the pumpkin is roasted with hot spices, which together with the sweetness of the vegetable provides a lovely balance and bang for your Christmas or New Year cheeseboard. This classic rhubarb chutney is one of the easiest to make, as all the ingredients go into one pan and are left to bubble away until thickened. How easy is that? With ginger and spices, this is quite robust in flavor, making it a lovely companion to meaty pies, pasties, hams, meats and stronger flavored cheeses. 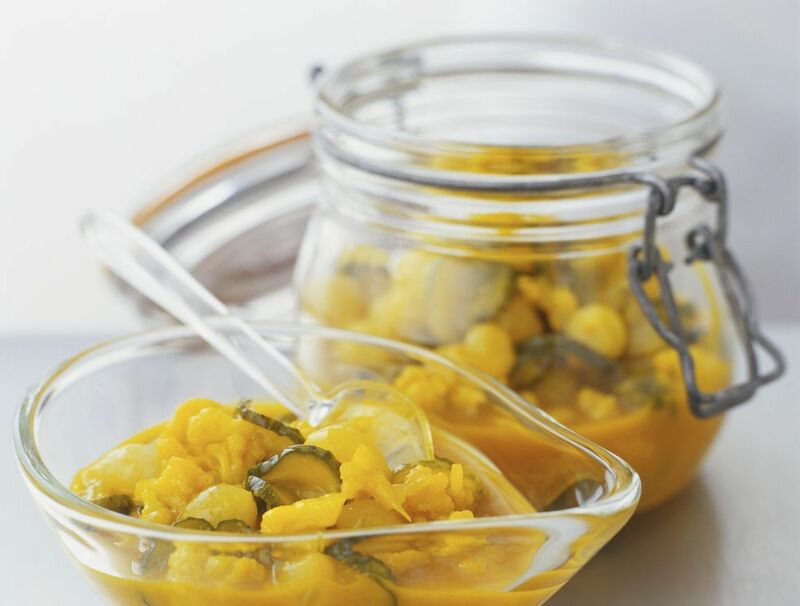 This bright, jolly, yellow-colored piccalilli is another British food eaten year round, but happens to be popular at Christmas and New Year. The pickle is believed to originate in the Indian subcontinent, and made with mustard, vinegar, salt and turmeric for the color. WE recommend pairing piccalilli with ham, cold meats or a good pork pie, as they create a deliciously, divine concoction. This relish could so easily be thought of as a summer dish with the use of both gooseberries and Elderflower. 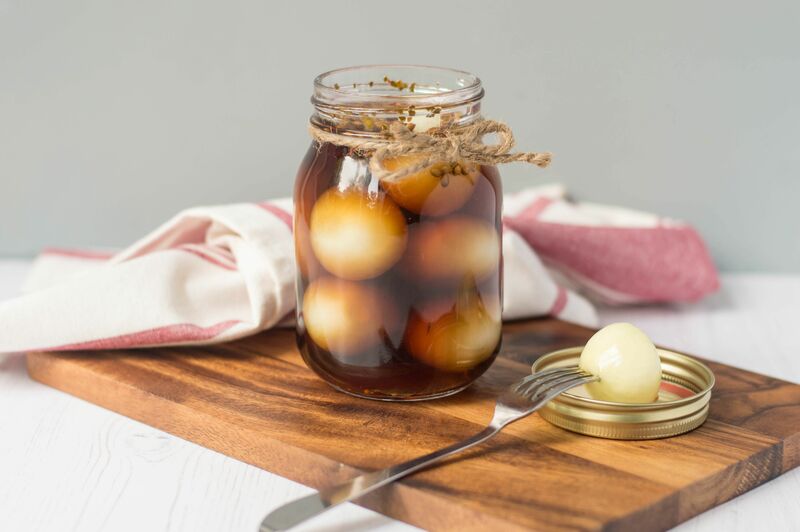 But despite these two being gentle flavors, together they create a distinct, sweet tastiness that is absolutely lovely with soft, milder cheeses such as goat cheese, or a less ripe Brie. Another softer flavored relish is this rhubarb relish. It relies solely on the winter rhubarb for an earthy slightly acidic taste, which comes into its own when put together with fatty meats like duck, goose and pork. A spoonful alongside will cut through any of the fattiness for a much cleaner, clearer taste. A jar of jam is more often than not eaten for the sweetness of the fruit and sugar. This perky one made with plums and ginger is less sweet than a more traditional jam, but still just as excellent for the Christmas table. Pair with slices of cold roast goose or duck, or on the breakfast table - for spreading onto toast - and watch it disappear. Where would Christmas be without this beauty of richly, spiced dried fruits, sugar and suet, all cooked together into a sticky, jam-like texture for filling the classic British Christmas treat of mince pies? Simply not the same.